I have created this page in order to make it easy to find all of my work regarding metabolic and lifestyle strategies to combat Alzheimer’s disease. It will be updated regularly. 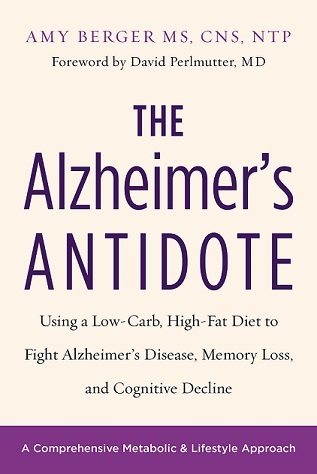 The cornerstone of this research is my book, The Alzheimer’s Antidote: Using a Low-Carb, High-Fat Diet to Fight Alzheimer's Disease, Memory Loss, and Cognitive Decline. In January 2018, I recorded a webinar for the Irish Institute of Nutrition & Health. It was a bit long -- about two hours, total, but it is the most detailed and informative presentation I’ve ever given. You can download and save the file here (it’s a very large file), or simply watch it here. There’s a Q&A for the last approximately 40 minutes. I recommend listening through to the end, because there's some good extra information during that time. In November 2017, I recorded a short video about Alzheimer’s for the Adapt Live/Adapt Your Life program. It was only about 21 minutes, so it just scratched the surface of Alzheimer’s as a metabolic illness -- “type 3 diabetes” -- but it’s a good, basic intro for someone who wants a short overview. You can watch it here. I gave a talk on Alzheimer’s at KetoCon 2018, discussing Alzheimer’s as a metabolic condition – “type 3 diabetes,” and the potential therapeutic use of ketogenic diets. Watch it here. Provides a brief description of the book and why I wrote it. A closer look at a study that indicated increased risk for Alzheimer’s in people with elevated blood glucose. It’s great that this information is starting to trickle into the mainstream media, but unfortunately, the dietary recommendations researchers provide are still the same old low-fat, high-carb advice that has already failed us for over a half-century. A 3-part series in which I explored the pros and cons of employing exogenous ketones as therapy for Alzheimer’s disease. These compounds do have a potential role in helping people with Alzheimer’s and other forms of cognitive impairment/decline, but they’re not a magic bullet. Read the post to find out why. Guest post on the blog of Robb Wolf, well-known advocate for “Paleo”-style diets and ancestral health. Is Alzheimer’s a Metabolic Disease? 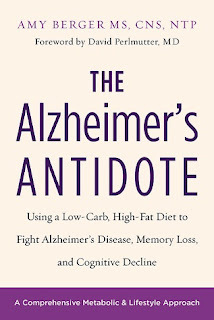 Part 1 of what are probably my most “readable” and educational posts explaining the basics of Alzheimer’s as “type 3 diabetes” or “brain insulin resistance,” and the use of ketogenic diets and exogenous ketones as nutritional therapy. (Written for KetoDiet App.) And here's the link to part 2, on applying the ketogenic diet for this condition. *The next four links below are to posts I wrote for Designs for Health (DFH), a supplement and nutraceutical manufacturer and one of the most reputable and well-respected companies in the industry. Please note that their website is undergoing a transition and unfortunately some of the blog posts did not transfer over properly. Some of these posts are missing commas, so everything will seem like run-on sentences and the posts may be a little difficult to read. If you can tough it out, the information is worth it. A post for DFH in which I summarize the consistent failure of the “amyloid hypothesis,” and why we must move away from targeting amyloid proteins & plaques if we are to finally start making inroads into actually doing something about Alzheimer’s. Every drug developed to target amyloid has failed to have any positive impact on this disease. Continuing to funnel research dollars toward this failed trajectory will only delay research into avenues that are far more promising. A post for Designs for Health (DFH) in which I cover the promising and hopeful light in the darkness that is Alzheimer’s: if metabolic problems—specifically alterations in glucose and insulin—are contributing to this illness, then there is something we can do about it. A post for DFH in which I bust some of the myths well-meaning but misguided researchers are putting forth about Alzheimer’s and the progress (or lack thereof) in developing effective treatments. Does Antacid Use Increase Risk for Dementia? A DFH post in which I cover a potential link between long-term antacid use and increased risk for dementia. If you take a drug that reduces stomach acid, and as a consequence, impairs absorption of zinc, B12, magnesium, and other nutrients crucial for brain health and cognitive function, might you increase your risk for dementia? Read and find out. A feature article on the dietary and metabolic factors that are believed to underlie Alzheimer’s disease, as well as general guidance on how to reverse them. This was published in the Summer 2014 issue of Wise Traditions, the journal of the Weston A. Price Foundation, which is a non-profit organization dedicated to educating people about nutrient-dense diets, robust physical and mental health, sustainable and humane farming, and in general, the diet and lifestyle practices that kept our ancestors healthy and robust well into old age, and free of the chronic conditions that afflict so many of us today (such as heart disease, diabetes, metabolic syndrome, obesity, infertility, emotional instability, and more.) Please note: a more detailed version of this article, containing slightly more discussion of biochemical mechanisms, is available via email. Please contact me if you would prefer to read that version. In addition to my written work, I have been interviewed on several podcasts about nutrition and lifestyle interventions for Alzheimer’s, as well on low-carb and ketogenic diets in general. You can find all of these interviews cataloged here. Nutrition and Alzheimer's disease: The detrimental role of a high carbohydrate diet. Seneff S, Wainwright G, Mascitelli L. Eur J Intern Med. 2011 Apr;22(2):134-40. High carbohydrate diets and Alzheimer’s disease. Henderson ST. Med Hypotheses. 2004;62(5):689-700. Can Ketones Help Rescue Brain Fuel Supply in Later Life? Implications for Cognitive Health during Aging and the Treatment of Alzheimer’s Disease. Cunnane SC, Courchesne-Loyer A, Vandenberghe C, et al. Frontiers in Molecular Neuroscience. 2016;9:53. Can ketones compensate for deteriorating brain glucose uptake during aging? Implications for the risk and treatment of Alzheimer's disease. Cunnane SC, Courchesne-Loyer A, St-Pierre V, et al. Ann N Y Acad Sci. 2016 Mar;1367(1):12-20. Brain Fuel Metabolism, Aging and Alzheimer’s Disease. Cunnane S, Nugent S, Roy M, et al. Nutrition (Burbank, Los Angeles County, Calif). 2011;27(1):3-20. Brain mitochondrial dysfunction as a link between Alzheimer's disease and diabetes. Moreira PI, Santos MS, Seiça R, Oliveira CR. J Neurol Sci. 2007 Jun 15;257(1-2):206-14. A unifying hypothesis of Alzheimer's disease. IV. Causation and sequence of events. Heininger K. Rev Neurosci. 2000;11 Spec No:213-328. *This is a very long and dense piece, but extremely educational. Full text available for download here. Reversal of cognitive decline: A novel therapeutic program. Bredesen DE. Aging (Albany NY). 2014 Sep;6(9):707-17. Brain metabolic dysfunction at the core of Alzheimer’s disease. De la Monte SM, Tong M. Biochemical pharmacology. 2014;88(4):548-559. Insulin signaling, glucose metabolism and mitochondria: major players in Alzheimer's disease and diabetes interrelation. Brain Res. Correia SC, Santos RX, Carvalho C et al. Insulin resistance and Alzheimer’s disease. De la Monte SM. BMB reports. 2009;42(8):475-481. Type 3 Diabetes is Sporadic Alzheimer’s disease: Mini-Review. De la Monte SM. European neuropsychopharmacology : the journal of the European College of Neuropsychopharmacology. 2014;24(12):1954-1960. Metabolic derangements mediate cognitive impairment and Alzheimer’s disease: role of peripheral insulin resistance diseases. De la Monte SM. Panminerva medica. 2012;54(3):171-178. Alzheimer's disease and diabetes: an integrative view of the role of mitochondria, oxidative stress, and insulin. Moreira PI. J Alzheimers Dis. 2012;30 Suppl 2:S199-215. The Alzheimer’s Disease Mitochondrial Cascade Hypothesis: Progress and Perspectives. Swerdlow RH, Burns JM, Khan SM. Biochimica et biophysica acta. 2014;1842(8):1219-1231. Insulin resistance and Alzheimer's disease: molecular links & clinical implications. Neumann KF, Rojo L et al. Curr Alzheimer Res. 2008 Oct;5(5):438-47. Disclaimer: Amy Berger, M.S., NTP, is not a physician and Tuit Nutrition, LLC, is not a medical practice. The information contained on this site is not intended to diagnose, treat, cure, or prevent any medical condition.